Last panel should be accompanied by the sexiest saxophone rift you can muster. Is Mr. Slender wanted in Knick Knack Canyon for out shining all of the other performers with his natural brilliance? Because I’m pretty sure that would happen. Knickknack canyon was built on the valley of what will eventually be called Rhythm Ridge. The whole Nightmare Knight episode had another iteration a couple decades ago, particularly quick one too. Hardly anyone noticed. A couple millennia later…. Why is nerdbot/evan wanted? What did he do? 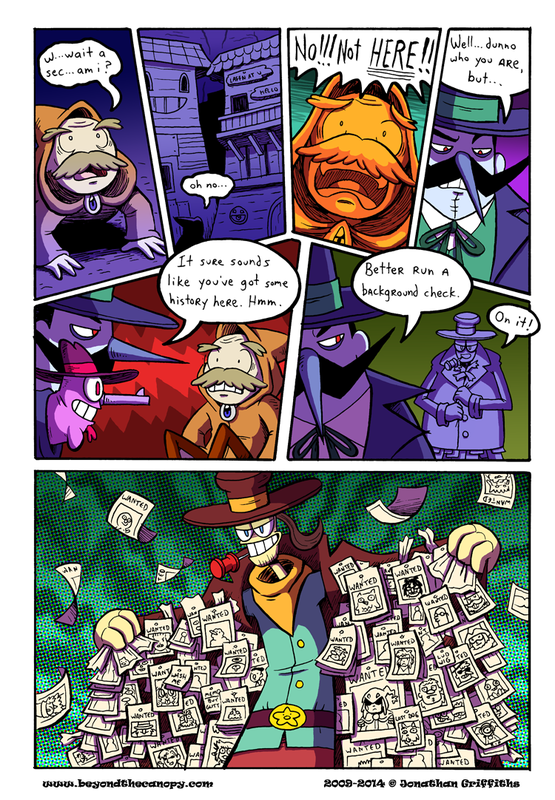 Pretty sure I see Mr. Spender (from Paranatural) in the bottom left there. I see Descole from Professor Layton, I think a Flintstone, Mr. Spender, Noisemaster, and what could be but probably isn’t, Ducky Momo. Also, crime rates must be sky high in Knick Knack Canyon. I know I’m late to the party, but nobody noticed MY FAVORITE REFERENCE!!! Near top right on the left side, weeping eyeball with Halo. Kirby 64, anyone? if you sold that last panel as a full size poster, i’d totally buy it. Looks like Greliz has a poster in the bottom left too. The Menagerie Valley mafia has roots everywhere. You don’t need to corrupt an entire force, or even the head. Just get a few in who are willing to give the police and the mafia a…”common enemy”. Also Greliz was probably loitering. Bartz Simpson, bottom. Right next to the guy. Guess they aren’t so exempt after all….